Preparing for Hurricane Sandy: As the Storm Comes In | The Voss Law Firm, P.C. Hurricane Sandy is already battering the coast, and it’s projected to be a storm of historic proportions. The hurricane itself is only a Category 1, which would be considered relatively minor news in the hurricane-savvy south, but the Northeast rarely has to face hurricane-type storms. Meteorologists say it’s meeting up with two other weather systems which are intensifying the storm, so it’s not losing steam as it travels into the cooler northern waters. In short, this is shaping up to be a multi-billion dollar storm as it makes landfall Monday afternoon and evening. Are You Prepared for Hurricane Sandy? If you haven’t already done so, take precautions to prepare for the hurricane. You should be well stocked on water in the event that you lose power and a boil water order is issued. Fill anything you have with clean tap water - large pots, empty gallon jugs, empty two-liter soda bottles - make sure you have a good supply of water on hand. Stock up on non-perishable food that doesn’t require electricity to cook, in the event that you have a power outage. Avoid refrigerated and frozen foods, which may spoil. Eat any refrigerated and frozen foods for lunch or dinner today to minimize waste in the event that you lose power. Widespread power outages are predicted. Make sure all of your essential electronic devices are fully charged - cell phones, tablet devices, laptops, Kindles - to prepare for the duration of the power outage. Have batteries on hand to power flashlights, radios and other electronic devices that you may want during the storm. Avoid using candles for light, if possible, as they can cause fires. Bring inside or secure anything that’s still outside. Bring inside lawn furniture, trash barrels or any objects that could become flying projectiles in high winds. If you can’t bring it inside, tie it down with ropes or bungee cords to keep it from flying around and causing damage. Stay tuned to your local media outlets. Find out if your city or local police department have Twitter or Facebook feeds and subscribe. Stay up-to-the-minute with warnings and weather updates. Some states in the area are closing roads and shutting down public transportation, so stay alert to these issues. 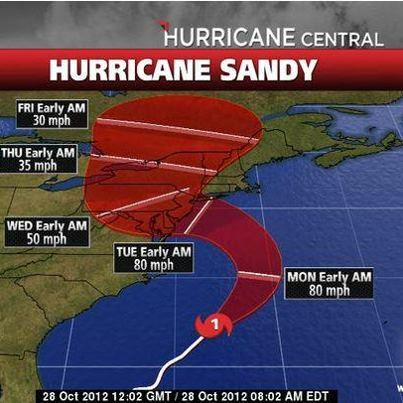 It’s not too late - take steps now to prepare for Hurricane Sandy’s landfall. Before the storm, the biggest objective is to minimize damage and ensure you have enough supplies on hand to weather extended power outages.